Ahead of her show at Paris Fashion Week, Designer Kristina Fidelskaya talks style, business and empowering women. Just four years after launching her own name brand, Kristina Fidelskaya has already achieved great success. 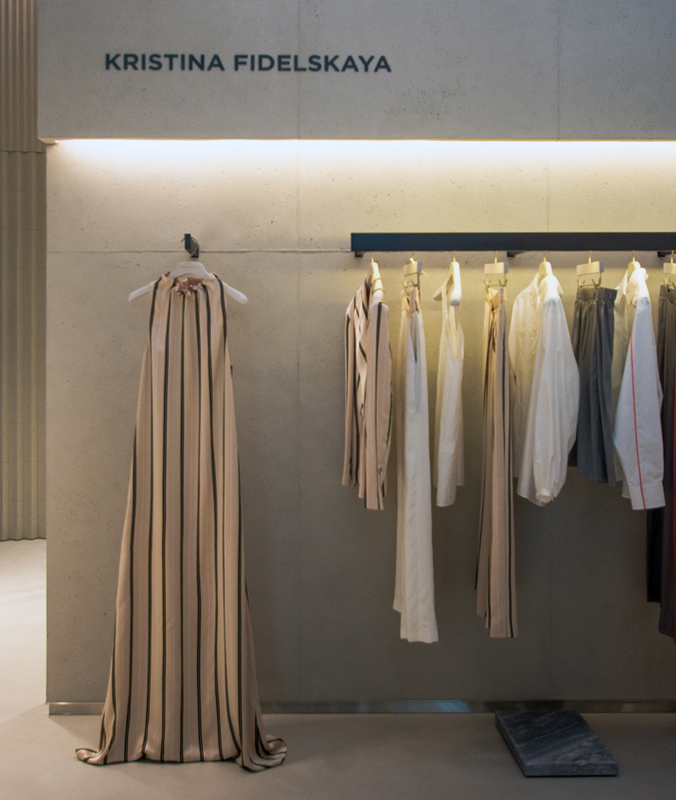 As designer and Creative Director, Fidelskaya is very much involved in her collections from start to finish as well as developing the brand for the future. While much of her product is made in Italy, Fidelskaya continues to have a strong base in the Middle East and uses that to her advantage. Her designs have a focus on enhancing the female form and making every woman feel strong, feminine, elegant and confident in a unique way. Sport lux meets elegant modest dressing with her wearable collections. Fidelskaya speaks to the modern woman – someone who much like herself is busy and requires versatility, comfort and style from clothes. For spring 2018 Kristina Fidelskaya had its debut runway show in Paris and received recognition both in the Middle East and worldwide and has become one of the fastest growing brands in the region. This was followed up by an equally successful fall/winter 2018 show that really put the brand on the map. While the first shows were off-schedule this February the brand will show on-schedule at Paris Fashion Week for the first time, and will subsequently open its first European store in the city. With all this going on Fidelskaya has also found the time to open her first store in Dubai Mall. The flagship store, which opened just last month embodies the I AM KRISTINA campaign, partnering with women who possess the strong, confident and powerful ethos of the brand. Ahead of her latest Paris Fashion Week show, A&E caught up with Kristina Fidelskaya to find out what makes her brand unique and why we can expect to see its further growth in 2019. What can we expect to find in your new Dubai mall store? The new boutique is a reflection of the Kristina Fidelskaya universe, where we welcome our customers to experience my vision of the modern woman. 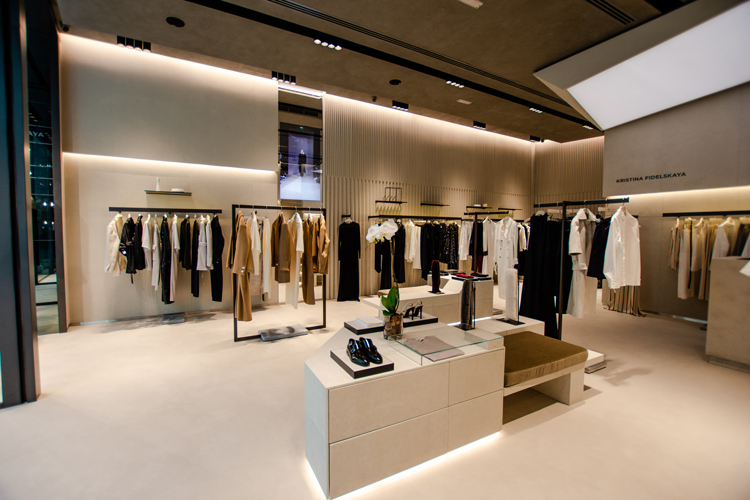 The brand’s philosophy and story is clearly visible throughout the boutique, reflected in the minimalistic design, natural colours and materials and the look and feel of the garments. As well as the ready-to-wear pieces we will be offering limited capsule collections, shoes, perfumes and other accessories. What can you tell us about your SS19 collection? Our SS19 collection is named; BEING. For this collection I have taken a very masculine idea and concept and have tried to recreate it in a feminine way. When you put on a man’s clothes or he puts his jacket over your shoulders you feel somebody loving you, protecting you and taking care of you. I wanted to bring these feelings to life as a fundamental element of the collection but recreate it in a feminine way. We are using classic prints that you usually expect in textures such as wool, cotton, or baby cashmere. We have modernized these by using lightweight technical fabrics. The collection also features a lot of unlined constructions, which makes the garments feel like a second skin. Soft, comfortable, and practical. How is the experience of showing in Paris for you? Paris has always been one of my favourite cities and it has always felt like home. Being able to present my brand there is a huge honour. To share your collection on a platform with some of the world’s greatest brands and designers is a dream come true. Don’t get me wrong, it is very hard work but it is so rewarding, and working with some of the greatest photographers, models, production houses and PR agency’s has enabled the Kristina Fidelskaya brand to gain international visibility fast. We have done three runway shows so far during Paris Fashion Week, which have been noticed by the industry, and I am always very proud that our hard work is well received and recognised. We have very recently been accepted and admitted by the ‘Fédération de la Haute Couture et de la Mode’ to be a part of the official calendar for Paris Fashion Week. We will be presenting our FW19 collection on-schedule! We are very excited about this opportunity and the further exposure Kristina Fidelskaya will gain from this amazing platform. We will also be opening our first European Boutique in Paris in March 2019. What makes a Kristina Fidelskaya design unique? If you take a closer look at any garment, you will see the many details, finishings, the techniques and fabrics used to create the garment. The Kristina Fidelskaya collections are always well-tailored, as we spend time creating the cut, shape, pattern, fit and feel, all through refined craftmanship, which derives from my strive for perfection. There are many steps to my creative process. I use high-quality fabrics sourced from the top Italian mills and factories and when I select the fabrics, they have to be very soft, comfortable and versatile. My goal is that when you wear a Kristina Fidelskaya piece, you don’t want to take it off. Why is it important for you to produce most of your pieces in Italy? I am a perfectionist and I want my customers to enjoy a product of the highest quality which means that the final product has to be as good as the sample that we create in our Atelier. Throughout my research and extensive sampling in various countries, I discovered that Italian craftsmanship is among the best in the world due to its long, rich fashion heritage. Most of my garments are finished by hand before they go through extensive quality control. So we produce 90% of our collections in Italy. A small select line of delicate dresses are made in the UK. A ‘Made in Italy’ label is globally recognised and stands for quality. Most of our fabrics are made in Italy, along with our shoes which are handmade and crafted by some of the most skilled artisans in the industry. A large amount of time, care, and attention to detail is put into creating the Kristina Fidelskaya product, Italian producers understand the quality standard that is a strong part of the brand, and the passion that is needed to create each piece. How would you describe the Kristina Fidelskaya woman? The Kristina Fidelskaya woman is my vision of the modern woman. Women in 2019 are busy, independent and determined. She can be a mother, or a sister taking care of her family, she studies and has a successful career, and is driven by ambition. I design my clothes for women who are on the go with a busy, versatile lifestyle. They love and appreciate quality, they want to wear something comfortable and also be effortlessly chic and stylish. I want to make any woman who looks in the mirror see someone confident and fierce, ready to take on the world. How do you create designs that empower women? When I design my collection I keep in mind the woman that embodies many different roles. A woman feels many different emotions and moods, and I like for her to be able to express this through the fashion and the designs she chooses to wear. I create my collection so that women can find something for every occasion and wear something that makes them feel confident, fierce and stylish at the same time. What advice do you have to upcoming entrepreneurs? Starting your own brand is very hard work. You have to be very well prepared, willing to commit to working long hours and making sacrifices, but it is of course so rewarding and worth it. You have to understand who your customer is and how your product is relevant in your marketplace, remaining true to your brand ethos is also key. You have to believe in what you do, and love and respect every opportunity that comes your way. You started your brand four years ago. What were the challenges you faced when launching? When you start a brand, it is very important to build a strong team, and it can be difficult in the beginning to attract the right talent that will also fit the brand philosophy. The fashion industry is very saturated and an extremely competitive market, so having faith and belief in your brand is key. As a new brand you have to be persistent in finding the right showroom, PR agency and suppliers, as many like to see a proven track record of success before doing business. It is vital to find the right people to work with, who understand your vision and goals. There are lots of elements to building and running a fashion brand, with time and experience you learn to overcome your challenges and grow. I get my inspiration from many different things in life. It can be from the books I read during my travels around the world, when I am surrounded by nature, when I hear a song I like, or see a beautiful painting in a museum. I love photography and I like to look at images from famous photographers to stimulate my creativity. I also love sports, and a lot of my designs include sportswear elements and details. It’s important to do things that you love and that make you happy, I believe then inspiration can find you. I am inspired by everyone that has the drive and determination and does their best, giving their energy and enthusiasm to bring good to the world in any way. I find inspiration in people who want to grow and make the most out of themselves. You are of course a mother, how do you create a balance between work and home? Life of course is very busy for all of us. I spend a lot of time in the office or travelling to Europe to oversee each part of the brand’s operations. My kids are very busy as well, after school they have activities and sports. I make sure to spend my weekends with my family, and take them with me on business trips (if my schedule allows it), and to put them to sleep (almost) every night. It’s very important to prioritise and manage your time carefully. If you organize everything in a very structured way you can take care of even more, but my kids and my family are always my first priority. That everything in our life starts from our childhood. Once you become a mother you recognise parts of yourself in your children, or see yourself in your mother when you were small. I have learnt that you don’t have to control and plan everything, it’s important to live in the moment and have lots of fun! Since I’ve had kids my perspective on life has definitely changed. I’ve experienced love in a way that I’ve never felt before. My priorities shifted and you instantly care about another soul, a soul that is part of you. I love being a mother and carry great respect for all mothers around the world. What does that term ‘women’s empowerment’ mean to you? It means to give your fellow women strength in any way to make her feel or be better. To make each woman strong, and the best version of herself. My new campaign is titled “I AM KRISTINA”. I am trying to show my vision of a strong woman, who is confident, fierce and stylish. How would you describe your brand in one sentence? My brand is a translation of my vision for the woman. A woman has many different roles, parts to play in her life, different emotions and occasions. My collections are very feminine, contemporary, comfortable and luxurious. Beauty is the thing they all share. If you can dream it you can do it, nothing is impossible. Fall in love with the process of becoming the best version of yourself. What is something that you still want to achieve that you haven’t done yet? Giving back is an important focus for Kristina Fidelskaya. In the future we are planning to work closely with different charity organisations and launch various campaigns where we want to make a difference and a positive change, with a positive empowering message. We know you have some exciting projects coming up. What can we expect to see from you in 2019? AMAZING COLLECTIONS! The #IAMKRISTINA campaign launched this January to promote the opening of our Dubai Mall boutique. This is not only a campaign but a strong brand message of the fierce, stylish and confident ethos that will be ongoing. We will be on the official calendar of Paris fashion week with our first on-schedule presentation and on-schedule catwalk show this February. And we are opening our first European boutique in Paris in March 2019.